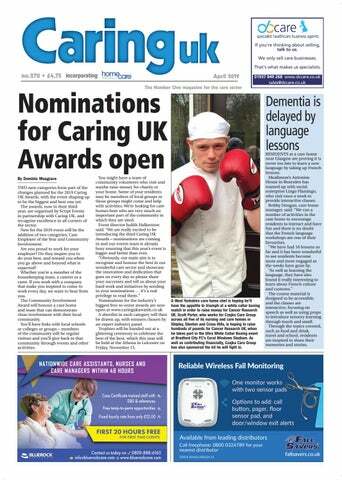 Caring UK is the number one magazine for managers in the elderly care sector. Our editorial pages feature top columnists, parliamentary and legal updates, news, people stories, event and exhibition previews, conference coverage, diary dates and business and property news. The magazine goes directly to the people with buying power - the budget-holders and decision-makers - which is why it is so effective at delivering product and service information to the right people. THE Independent Care Group's chief executive Lisa Pickard is moving on to a new role. She is joining not-for-profit organisation Five Lamps, which provides a range of services across Yorkshire and the North East. Chair Mike Padgham said: 'Lisa was only with us for a short time but in that time she had an impact on the Independent Care Group and helped us to shape the way forward for the organisation, so we are grateful to her for that. 'She is moving on to another, different challenge and we wish her the very best in her new role. THE Gables residential home in Gorleston, Norfolk has thanked 10 members of its team for their long and dedicated service to the home. A special presentation was held to formally acknowledge staff members for their continued work, which between them works out to 120 years of combined service. Each staff member was presented with a pin badge, certificate and a gift by the home's manager Chris Chambers and operations manager Debbie de Beer. Those thanked included: Hellina Burton - 25 years - domestic assistant; Wendy Putman - 20 years - care assistant; Clare Burrows - 15 years - senior care assistant; Christina Thompson - 15 years - senior care assistant; Angela Robb - 10 years - care assistant; Annie Sazon - 10 years - care assistant; Juan Sazon - 10 years - care assistant; Candy Bernadas - five years - housekeeper; Louise Bould - five years - administrator; Siobhan Donohoe - five years - care assistant. MARLING Court Care Home in Hampton hosted a dementia awareness day. The aim of the day was to give people a better understanding of how dementia affects people living with it, and it was attended by more than 40 people from the local community. Attendees included staff from local businesses, families caring for people living with dementia, healthcare professionals and charity workers, who all agreed it had provided a valuable insight into the effects of the condition. Key to understanding this was the opportunity to join a 'virtual dementia tour'. Led by Training2care, it was invented 20 years ago in America by world renowned professional PK Beville, who created the experience as part of her research into dementia. Each participant was fully immersed in an experience that was the closest we can give a person with a healthy brain to what dementia might be like. PLANS for a new 44-bed care home in a Suffolk town have been approved despite vociferous opposition from local residents. Tanner & Tilley Town Planning and Development Consultants were successful in obtaining planning consent for Angel Care to construct the facility after a more ambitious scheme was rejected on appeal in January 2012. Tanner & Tilley operations director John Montgomery told the Development Control Sub-Committee the new application fully addressed the appeal inspector's concerns regarding effect on the amenities of surrounding properties and, in particular, those in Godfreys Wood to the rear. The committee heard from local residents who opposed the scheme before granting planning permission, but only on the chairperson's casting vote.